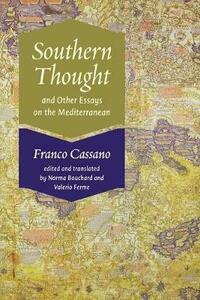 In 1996, with the publication of Southern Thought, Italian writer Franco Cassano became widely recognized as one of the most important voices in the contemporary Italian and European intellectual scene. In this engaging and provocative book, which ranges effortlessly between the fields of sociology, political science, philosophy, cultural anthropology, and literature, Cassano offers a critique of normative models of modernization derived from Eurocentric and North Atlantic paradigms, while claiming that autonomous paths to modernity exist in the Mediterranean and the so-called Global Souths. Cassano's rethinking of the South seeks nothing less than to reverse the North-South relationship: "not to think of the South in light of modernity, but rather to think of modernity in light of the South." In this work, the South is no longer a belated, imperfect, incomplete, and not-yet North but the space of a differential, autonomous identity to be recovered and rediscovered. Thus, Southern Thought not only exemplifies a brilliant critique of Occidentalism but represents a valiant attempt to restore agency and dignity to the heritage and legacies of Southern civilizations and cultures. Four additional essays supplement this English translation of the original Italian book.